These DIY headboard ideas with plans are so easy and cheap that you can make them over a weekend. Check out the ideas for all types of headboards. There are few home projects with such a significant impact on decor as a DIY headboard. It transforms the bedroom, and it can make or break your entire interior design. That’s why, if you’ve decided to save some money and create your headboard, you have to take it seriously. And we’ve come up with this article as your ultimate guide to building the best headboard you can make yourself. From rustic farmhouse headboards to modern tufted ones, from simple projects for your bed to headboards with shelves, lighting, and storage. We have a tutorial and plans with instructions for each and every type of headboard that you can use to make your own. Read through it to find the materials, tools, and considerations needed to take on such a project, then choose the right tutorial to make it really easy for you. Let’s get crafting! These are the biggest size headboards and they require special measurement. If you want to make a headboard for this particular size, these plans are the perfect fit for you. These are the most popular size headboards. A queen size headboard will fit most bed frames, including twin XL sizes. It’s easier to adjust the measurements for your custom needs using these plans too. These headboards for the smallest size beds which can fit one person. They are usually designed for small spaces and includes storage and shelves to make a functional piece of furniture. Next is the list of all headboard ideas by material and design type. Be sure to check them all out as several plans are flexible and customizable for any bed size. When it comes to wooden DIY headboards, there are many different types. You can choose to make a headboard out of pallets, wooden planks, and even an old door or fireplace mantel. It all depends on the style that you are looking to achieve. If you’re looking to achieve a more classic look, an old door or fireplace mantel will work wonders for you. However, if you are looking for a more contemporary and modern headboard, then pallets or wooden planks would be your best choice. This is an easy beginner level project that you can make over a weekend. The freestanding wood headboard allows you to fit it to any bed of the right size. These plans are catered to a queen size bed. The included tutorial with instructions will guide you through to build your own custom headboard. A stylish wood headboard like this will definitely transform your bedroom decor. This headboard only looks like it’s made of reclaimed wood. If that’s the look you want but you don’t want to use salvaged wood, you can go for these plans. They are for a king size bed – so if that’s the size you need, it’s the perfect fit for you. Check it out and try it out! This headboard only looks like it’s made of wood logs. In reality, it uses inexpensive wood rounds and plywood to make this charming and whimsical headboard. And the best part is that it’s very easy to make. So why not create something unique like this at home? Check out this awesome tutorial with instructions. We will see wood blocks being used in a few tutorials on this list. Indeed, it’s a unique way to make a charming headboard. Albeit it is more involved than most other tutorials, it’s all worth it. 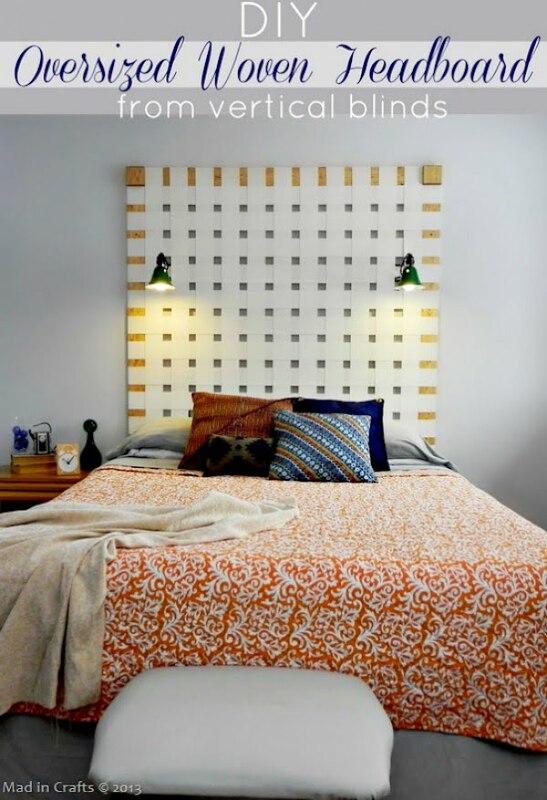 Check out how you can build a headboard from wood blocks in the mid-century modern style. 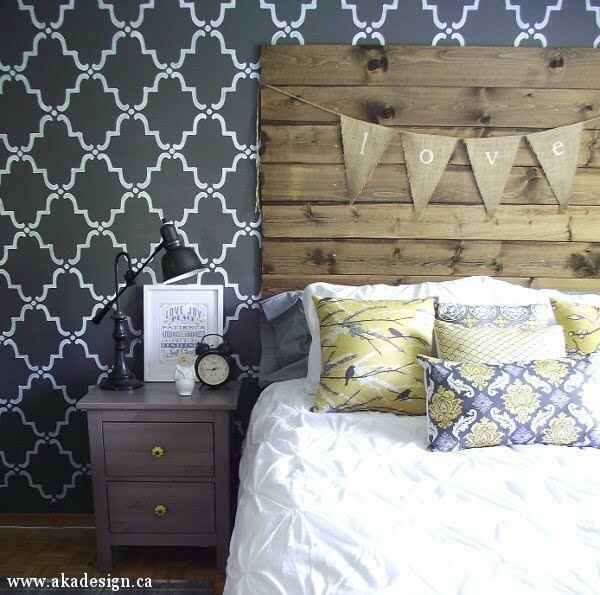 This is another one of the most impressive DIY headboards. It’s for a king size bed and uses wood shims to create a striking texture. Such a headboard gives the bedroom a complete makeover and a lot of visual interest. If you want to build it yourself, check out the tutorial for plans and instructions. Here’s another great video tutorial if you like learning from video rather than reading instructions. It shows you how to make a headboard from wood for a queen size bed. It’s beginner friendly and you can start right away as long as you have materials and tools. Check it out! Modernism takes another shape, and while it is good ole’ wood blocks we’re referring to, your bedroom wall is about to drastically pop! First off, get your hands on a set of wood blocks, which shouldn’t cost you a fortune, but will still deliver an expensive headboard outlook. The project itself costs less than $80, and creating it will require simple materials, such as plywood, wood posts, tubes and some paint and oil to finish the piece in style! The design itself focuses on giving this wood brick headboard a different dimension, allowing some blocks to pop more than others! Opening up the bedroom space doesn’t have to be all about the windows and doors. Instead, try focusing your attention of creating a majestic and clean herringbone headboard, which doesn’t take up a lot of time to complete, and still produces an upbeat and soothing bedroom feel at the same time. To create it, you will need a pile of boards, narrow and long enough to cover the desired wall area. To secure the alignment of the boards, set up the patterned boards onto a plywood frame, which will surely need a bit of smoothing and painting to perfect it! IKEA hacks are our favorites because you can accomplish a lot of things in your home decor without breaking the bank. You can make an attractive rustic wood imitation headboard by using Stikwood sticky tiles on your basic IKEA headboard very easily. Check out this tutorial for details. This is a custom headboard idea which will require you to have some essential carpentry experience as also tools such as a circular saw, a miter saw, etc. However, if you are a DIYer familiar with working with wood, this will be a cinch. Check out the tutorial to find more. 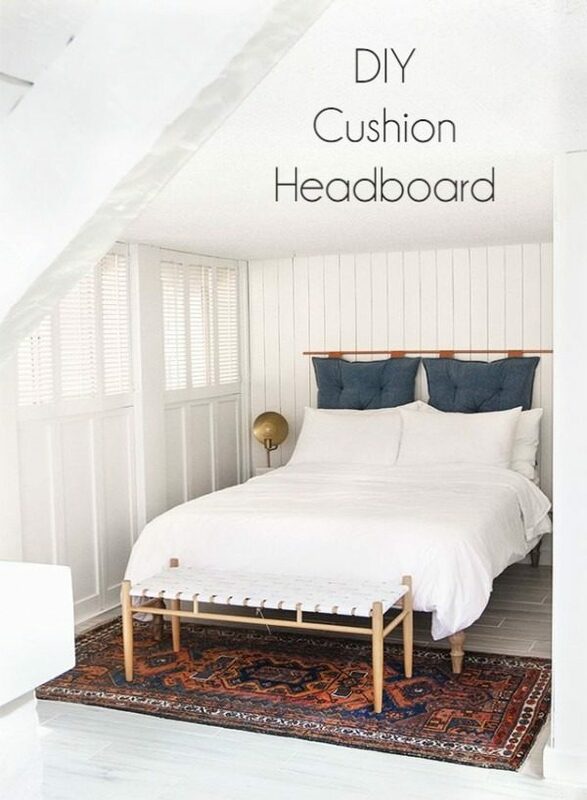 The most amazing thing about this headboard is that it was made as part of a 24 hour complete roof-to-floor makeover of a bedroom with a modern farmhouse theme. And chic though the headboard may look, it would set you back no more than a paltry dollar eight! Pretty cool, we would say? Again, classic as it may look, this live edge headboard involves little work. Get a good quality grained plywood, use a jigsaw woodcutter to make the pattern you want and then stain paint using staining pads. The pictures should suffice themselves, but do follow the tutorial for a few extra details. This one is funk with a rustic flavor to it and would pretty much suit all lightly (and funkily) themed décor. The one in the tutorial is used for a King-sized bed in the master bedroom. But you can a make a smaller one if you like and install it on the kids’ room. Check the tutorial to find how easy and fun this whole project is as also to get some good ideas on how to decorate the wall space right above the headboard. We adore the neat and sophisticated look of this DIY custom headboard fashioned with thick plywood sheets and pine furring strips. Check the tutorial to get a full list of materials you will need for the project and instructions on planning and execution. Upholstered headboards have an advantage of being lighter than their wooden counterparts (though they usually have a wooden frame too). You can also use countless fabric types and patterns to really let your creativity flow. Check out these ideas for this type of headboards. This dreamy hippie headboard is a pure sight for sore eyes! Its fantastic and colorful pattern is designed in such a way to enable you to get the work done in no time, and still present excellent results. To create this headboard, you will need a thin frame, wrapped in whichever fabric you prefer, or a colorful one such as this one! Finally, it will take a few wall mount screws to hang it above the bed! Keep the bed sheeting neutral to allow this headboard to pop, as it should. As for cost, the elements of this project are both affordable and available. There are countless ways to add some charm and design to your plain bedroom wall, and this DIY fabric headboard is here to testify to it. This is an excellent project for anyone looking forward to creating a custom-made and stylish headboard in no time! To carry out this project right, you will need various elements, including plywood, a memory foam mattress, batting enough to wrap the headboard frame twice, as well as a large piece of fabric of your choosing and a few garage tools. From there onwards, it all comes down to assembling the headboard pieces to create a dynamic and practical headboard worthy of respect! It is indeed a revelation to learn what can be done with a piece of hardwood and a sheet of fabric. This incredible upholstered headboard with stenciled fabric is as good as new and won’t cost you a fortune to complete it. Cut your headboard in whichever shape that fits your wall, and begin contemplating your fabric choice. A bit of stapling, here and there, is essential to secure the fabric onto the wood, and then we’re down to hanging the piece onto the wall itself. 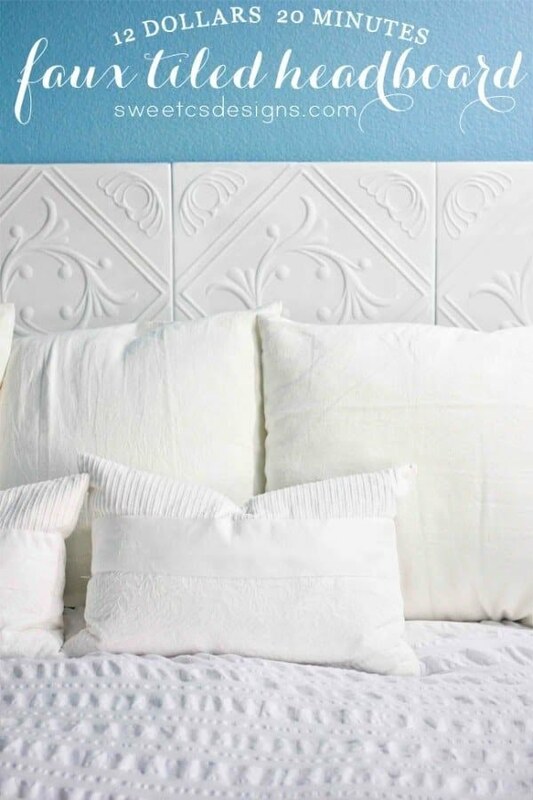 Inexpensive and practical, this stenciled fabric headboard works! Speaking of easygoing and beyond fashionable headboards, this sophisticated upholstered headboard with nail trim is a show-stopper for sure. Price-wise, this is not the cheapest project to execute, but it is not complex to set up gives the bedroom an expensive feel. The upholstered headboard uses various bits as unity, such as a pre-purchased headboard frame, nailhead trim, foam, batting, and then finally, a great fabric! A stapler comes in handy to secure the elements, and the process of putting them all together is not time-consuming at all! As a simple project, this headboard idea works in light spaces and creates an inviting ambient. You wouldn’t believe this upholstered headboard is a DIY project because it looks so luxurious. You can make something like that at home, and all you need is the right materials. The tutorial will guide you through the process step by step. 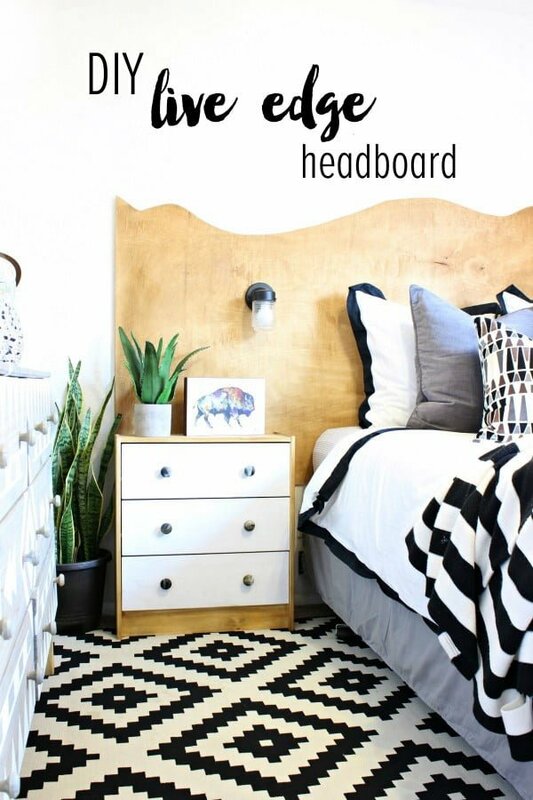 Another large DIY headboard that you can use as the centerpiece of your bedroom. This one is a fabric batting pasted over a base plywood frame board. Choose the fabric to match the theme and decor of your room. Please check the tutorial for detailed instructions. Tufted headboards also use fabric but they’re also cushioned to be much softer than simply upholstered headboards. That makes them more comfortable and even classy looking. Here are DIY ideas for this type of headboards. While buying a tufted headboard for your master bedroom can be a strike for your wallet, you can also give it a shot at creating this masterpiece yourself! Truthfully, the project itself won’t take up more than a few hours of your time, but will deliver chicness and elegance to your bedroom for sure! Designing this headboard will require a few essential elements, such as a few pieces of plywood to create the basic frame, a piece of luxuriously looking fabric like suede or leather, as well as captivating bits such as buttons, balling and foam. This tufted DIY headboard is worth both your time and your budget! Derail yourself from rustic and traditional headboard concepts and think of stylish and captivating headboards such as this one. This particular headboard is composed of a plywood frame, a soft and bright fabric (although you can experiment with colors), a bunch of buttons, and just enough batting to cover the entire surface. Of course, aside from fabric, you can also play around with headboard shape and choose a more traditional or a classier outlook. 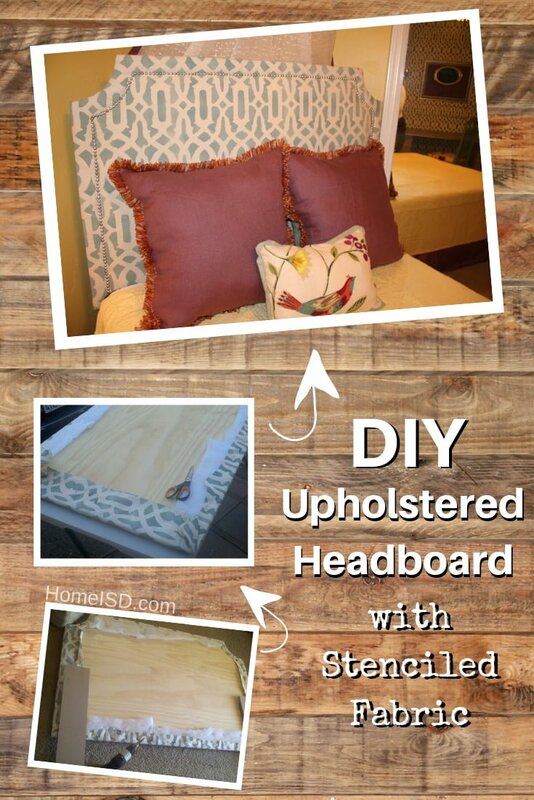 Use a stapler to bat the headboard plywood frame and decorate with matching fabric buttons. 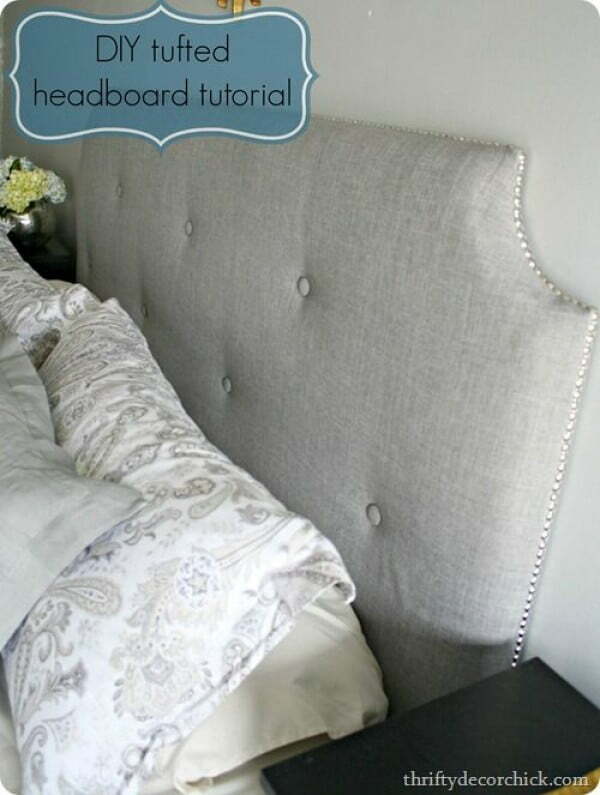 Pretty cheap and easy to do, this fancy headboard indeed calls for action! When you get a first look at it, this headboard looks so splendid that you may knit your brows at the word EASY. But follow the step-by-step guide on the tutorial and you’ll find that it really is easy, after all. We weren’t fibbing! This project will take a little more time to finish compared to others given in this list. But the sheer awesomeness of the finished piece makes it worthwhile. Or so we believe. Follow this great tutorial to find how you can transform a beefy piece of wood hardboard into something as opulent and luxurious as this one. Another Diamond headboard meant for a King bed. We love this DIY idea for the flexibility it allows. For instance, you get choices to make regarding the type of decorations you want; arms/no arms; tufting/no tufting; and finally, the choice in fabric. The headboard in the tutorial uses deep foam for tufting and Teal Microsuede as the upholstery fabric. Did you know that different headboard shapes came with different names? Well, check out this tutorial to find whether your current King bed headboard is an Alexander or a Radcliffe! 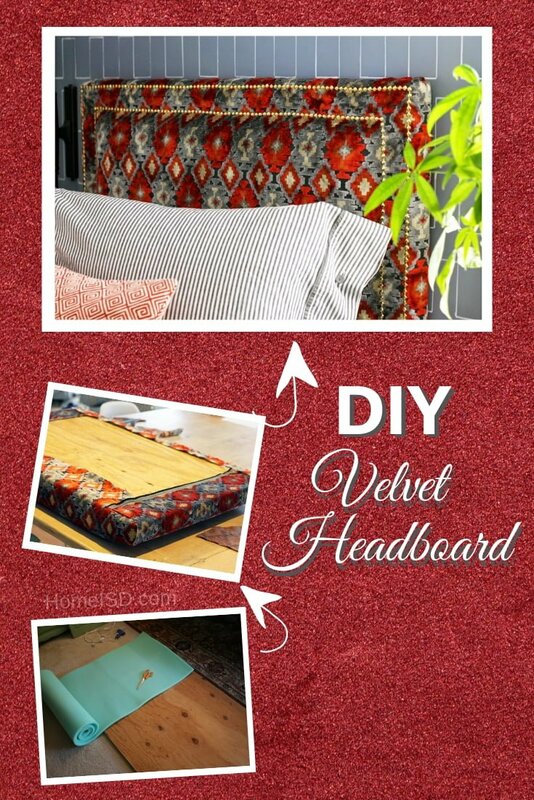 And yes, while you are at it, do check this excellent step-by-step guide on how to make a cool looking tufted headboard without having to burn a hole in your pocket. 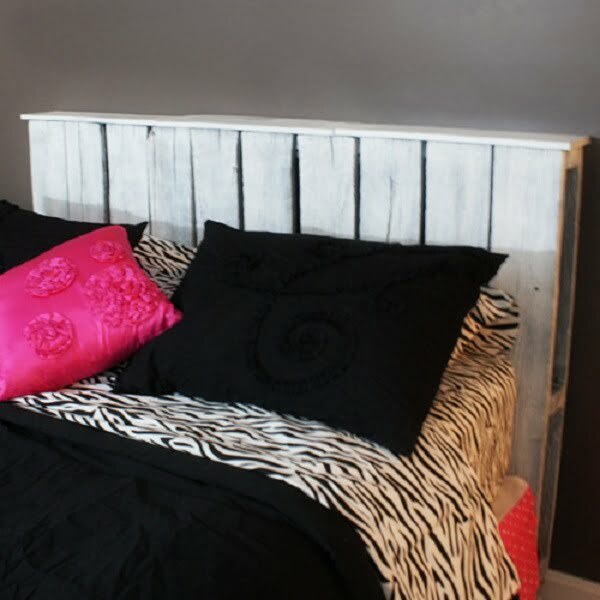 Pallet wood is among the most popular materials to make a headboard. It’s very cheap and easy to use. So making your headboard is a breeze from this wood. Check out these project ideas to DIY. Creating a luxurious master bedroom is not a demanding, nor a complicated task. If you think of utility, instead of price, you might even be surprised with what you come up with. Take a look at this rustic headboard that is beyond grandiose and impactful. Creating this unique headboard, you will need several elements, such as pallet boards, a frame, and other standard bits to hang and fortify the headboard. Overall this is a comfortable and practical project, which will cost you almost nothing unless you prefer fancier paint! This statement headboard certainly gives the bedroom the ‘Boom!’ it lacks! So you want to build a big king size headboard form pallet wood? Great choice! It’s actually one of the easiest ways to do it. And all you need is enough of pallet would which is easy to get. Check out this tutorial with plans and complete instructions. Don’t want to get involved in a big project to make a headboard? All you need is some pallet wood to make this wall mounted headboard. It’s small but just the right size for a queen size or twin size bed. Check out the tutorial to see how to do it. 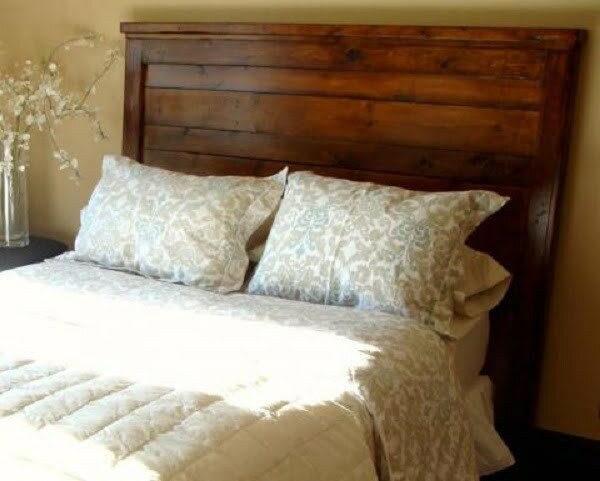 If all you need is a simple but unique headboard in lots of rustic charm, you can make a headboard form a pallet. You don’t even have to disassemble it, just customize the way you need. Check out the tutorial to see what we mean. Do you have a queen size bed that need a headboard? 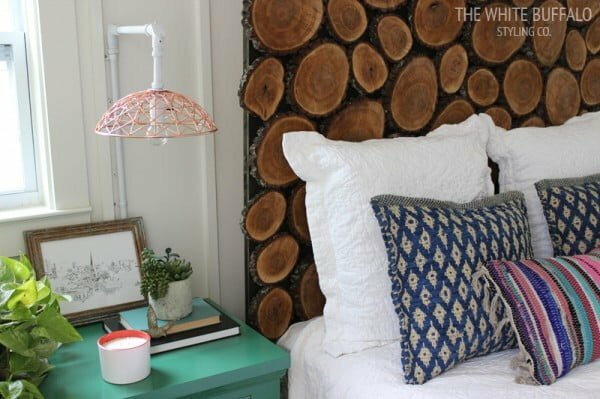 Make this custom rustic headboard from pallet wood. You’ll get this charming look with a lot of character. The tutorial will show you how to do it with plans. You won’t believe how easy it is to make this headboard with these plans. It takes pallet wood and a day’s work to do it. The result is an attractive headboard that looks like it’s store-bough. Give this tutorial a try. Rustic headboards are a special kind of a headboard. It has a warm handcrafted style that adds so much charm to bedroom decor. Everyone is after rustic, so why not make one yourself too. Check out these tutorials. This project and headboard idea is indeed impressive because it makes an entire accent wall. The colorful wood planks create a charming wood mosaic that is the pinnacle of this bedroom decor. And you can do the same in your home. Check out this tutorial for the details. 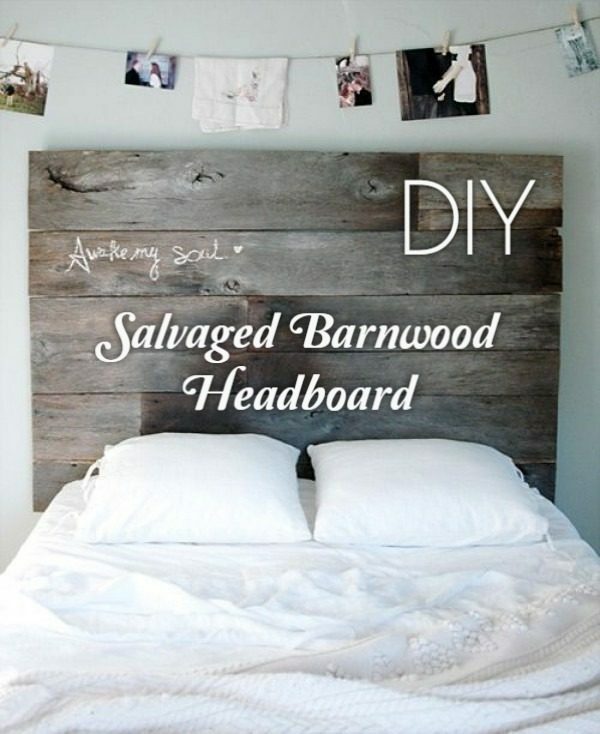 If you’re into the reclaimed wood look and rustic decor, this is one of the most charming DIY headboards you can make. Indeed, it’s full of character and transforms the bedroom completely. Interested? Check out the tutorial for the plans and instructions. Keep things simple, and you shall achieve excellence! This is true in every aspect and the same goes for DIY projects. This seemingly plain rustic headboard is in the shape of a sign and is composed of nothing but a few plywood boards. The project is great if you have a day to spare on accomplishing it. Install the hangers tightly and stain the wood if that works for your space. Finally, use a painting brush or any other method of coloring, choose a nice font and create a written headboard sign! As simple as it may seem, this cheap project is utterly effective and pragmatic. So, you are a lover of everything rustic. Now, if you happen to have an old barn door just waiting to be transformed, here goes your next DIY project. Creating a vintage headboard can be done by revolutionizing a traditional barn door or building one yourself. Depending on the barn door you have, you might need to polish it up and paint it to match your interior, but other than that, you’ll only need a couple of wall mount hangers and some nailing skills. If you have a few more bucks to spend, spend it on installing rustic night lamps on each side of the barn door headboard! Although nostalgic and romantic, rustic design can also adopt a more serious and classy note, as seen through this beautiful DIY headboard. The headboard itself doesn’t require plenty of wood distressing, and it takes a few pine planks to combine to get the initial rectangular concept. A few simple steps into strengthening and arranging the planks, you will be only left with wood staining, which can be fun, especially if you are looking for a contrasting ambient as in this photos. All in all, this headboard is ultra-cheap, practical and quite simple to execute, so why not give it a go? Another stately-looking king sized headboard. The one in the tutorial is done with a farmhouse theme in mind. 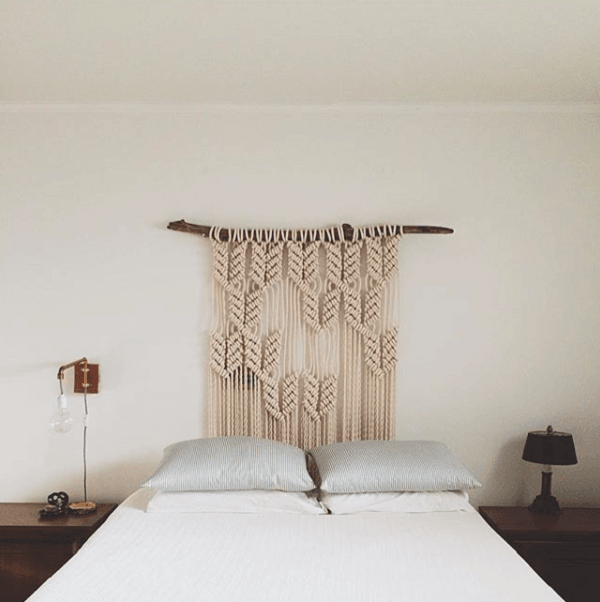 However, the cool thing about this DIY headboard is that depending primarily on the choice of the wood; you can take many different routes with this idea: farmhouse, rustic, modern eclectic, boho, transitional and so on. Why throw it away if you can re-use it. Using reclaimed wood and repurposed materials is the cheapest way to build your headboard. You won’t believe how creative some of these ideas are. So check out the following tutorials for really unique headboards. It is always nice if you can repurpose old but in-good-condition materials into a headboard. Saves you a hoard of money plus gives you the satisfaction of accomplishing something all by yourself. This tutorial guides you through how to fashion a headboard frame for a queen bed by repurposing an old door. If you want something big, bold and sturdy and one which looks super classy at the same time, you will love this DIY headboard idea. 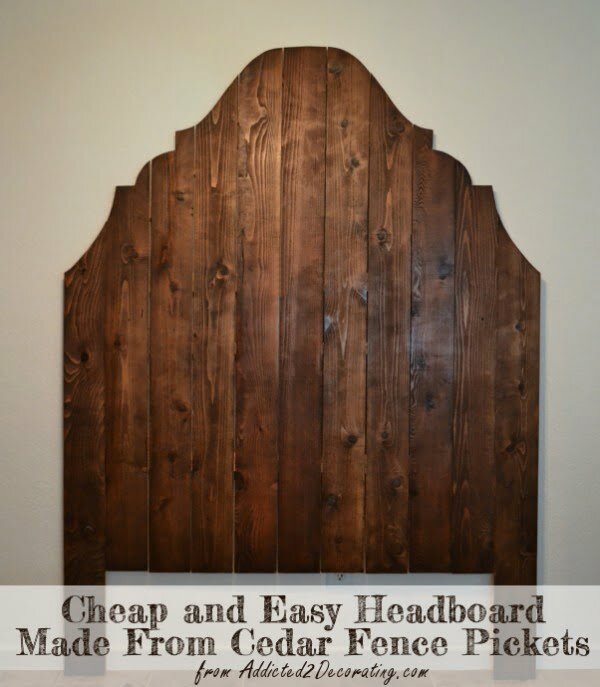 Made out of 13 cedar fence pickets which will set you back about $30, this is also a steal for the size and look you get. We bet you never thought fiving a set of old windows a chance to become a fabulous headboard! Well, thinking outside the box is often more fruitful than your average DIY project. Starting off this project will require vintage looking window frames (glass included), by your wall space. Make sure you secure and stabilize the headboard well, using picture frame hangers and hooks along with the traditional nailing method. Given the fact that you already have old windows lying around your garage, this project can be mastered at minimal or absolutely no cost! Another repurposed headboard idea you are going to love. If you don’t have the barnwood at your own home, you can easily get some at any garage sales and needless to say, it will cost you little. Follow the instructions on the tutorial to DIY this big, farmhouse theme headboard. We especially love the uneven shapes used in this headpiece. Do you like reading before sleep? You probably already have a nightstand lamp but a headboard with lights can be a much more functional. It’s especially useful in small bedrooms where a nightstand might not even be an option. Lights can also have decorative value. Check out these tutorials for headboards with lights. Go back in the good ole’ times, when master beds oozed comfort and relaxation! This fantastic DIY headboard with incorporated lighting is not just striking, but aesthetic as well! Use vintage hardwood planks, a set of retro night lamps, possibly iron ones. Some installation of the lights will be likely, but no complicated wiring necessary. Therefore, the process is relatively simple to do for any eager handyman looking to improve his bedroom drastically! After you undress and paint the hardwood properly, you will ultimately deliver a masterpiece! Welcome to your dream bed! The distressed look is very charming and it makes the ultimate bedroom decor focal point. You can make it from pallet wood using these plans. This idea also includes lighting fixtures making it a functional project. And surprisingly, it’s easy enough to complete over a weekend. This is a great idea for a twin size bed headboard with addition of light fixture. It’s a great project for a small kids bedroom and bed. The rustic look is charming and works well with farmhouse signs and decor. Check out the tutorial for instructions. This one is perfect to give a unique and playful feel to your headboard. Ideal for the kids’ room or to put in the guest room. Check out this marquee sign-inspired DIY headboard tutorial to find a step-by-step guide to this project. Why not add some extra storage to your new headboard. It’s a great way to increase storage space or to create an extra display shelf for bedroom decor. Check out these ideas for headboards with shelves. Give your plain white wall a purpose and create a beautiful DIY shelf headboard as a statement piece! Made of plywood, and involving some stapling, cutting and batting, this headboard can be constructed in a matter of hours. As this is a two-piece headboard, you will need to use a piece of fabric and a few buttons of your preference. Painting is an option if you like your headboard to match the rest of your bedroom, but nothing too complicated for the average handyman. Given that you already have an old shelf to use, you’ll only need to bat, connect, and wall-mount the base frame. Looks great, doesn’t it? If you want to add some extra storage with your new headboard, check out this idea. 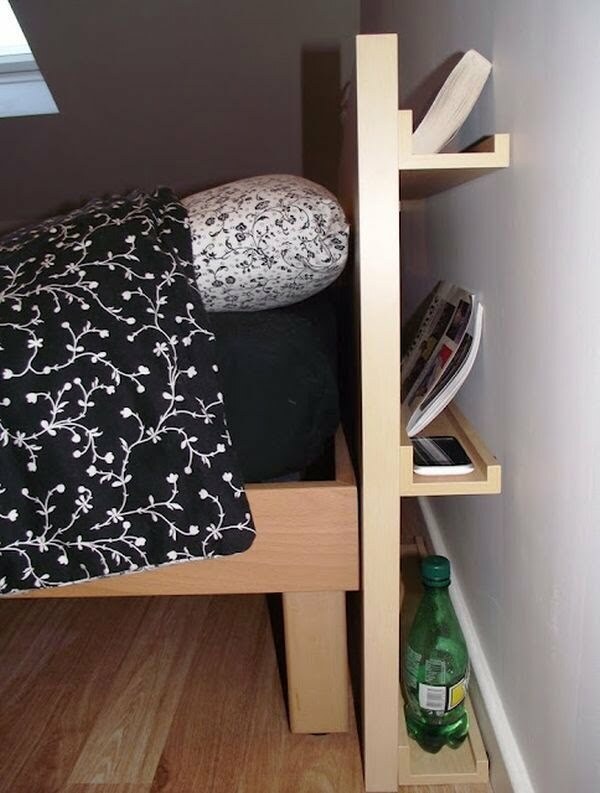 It’s a simple add-on to a regular headboard that gives hidden shelves for books and small accessories. If you like this idea, give this tutorial a try. The idea of using a bookcase as a headboard is big and very common. It’s the ideal solution in a small bedroom where storage space is of prime value. By adding a bookcase at the head of the bead you get all that shelf space that you can use to store things and create displays. It’s the best solution for the organization and decor. 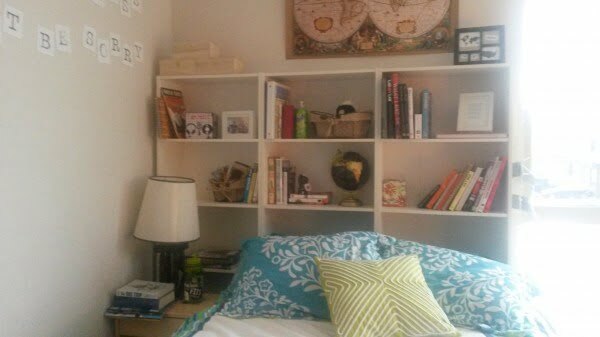 Check out this tutorial for an IKEA bookcase used as a headboard. A simple headboard like this can have built-in storage too. It looks visually interesting and charming, doesn’t it? It’s like a bookcase but much smaller. Just enough for a headboard. Want to build it at home? Check out the complete plans and instructions by following the above link. You can use a lot more kinds of materials for your DIY headboard. Here are some of the great examples for metallic, repurposed, and other headboards. 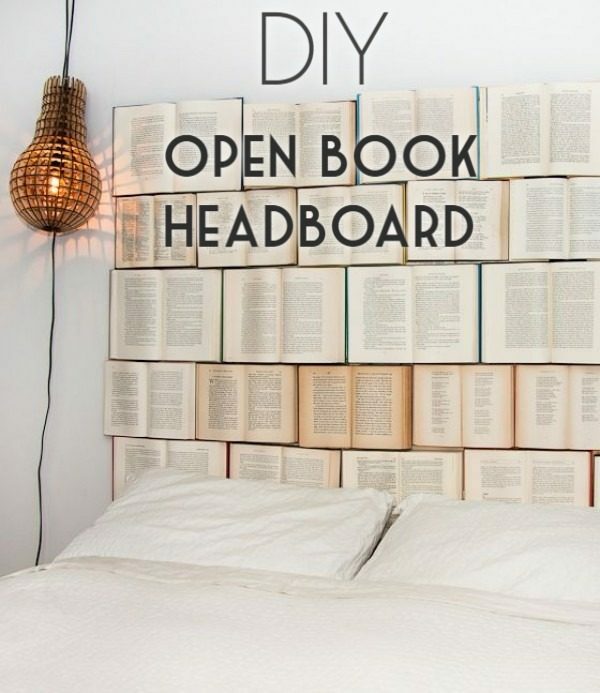 Quite a hassle-free DIY headboard idea. All you’ll need is a surface that can be prepared from Wood, MDF and so on (or you can buy a readymade one) and a metallic gold foil. The only difficult part is to smooth out the air bubbles under the foil as you stick it to the headboard. Check this great tutorial to find out how you can pull off a neat job of it. A great tutorial which shows you don’t always need wood to create an attractive headboard. Follow this tutorial to get the basic idea, and all you need to do then is to get some table mats that fit with the décor of the rest of the room and turn them into a legitimate headboard in virtually no time! We love the large and stately appearance of this tiled headboard with that unmistakably Middle Eastern style achieved through the choice of the tiles. And for all its stateliness, it is really easy and quick to make. Check the photos and the instructions in the tutorial to find more. We love these floor cushion headboards for their modern and relaxed look. The finished product looks like a nice alternative to traditional headboards, and the project can be completed real quick and with supplies that would cost you little. If you have some old vertical blinds lying around at your garage, you can put them to great use to do up a great-looking headboard for a master bed. Building the wood frame would take you some time, and math… and patience! But once you have got the frame ready, the rest is a cinch. Check out the tutorial to find how. If you want a lightning fast DIY headboard on a razor-thin budget, you will love this idea. You will need some foam faux titles, some scotch mounting tape, and absolutely zero DIY skills to prepare this one. And for all that, it looks classy enough. Check the tutorial and give it a try if you want. Nighttime reading, anyone? Well, this one is certainly above board, but if you are one of those persons with a cheeky taste for things ‘above board,’ you are going to like it. This is also repurposing to the extreme. The photo here must’ve given you a good idea of what we are talking about, so if you are still interested, please feel free to check the tutorial to find how you can get this one made for and by yourself. Looking for something different? 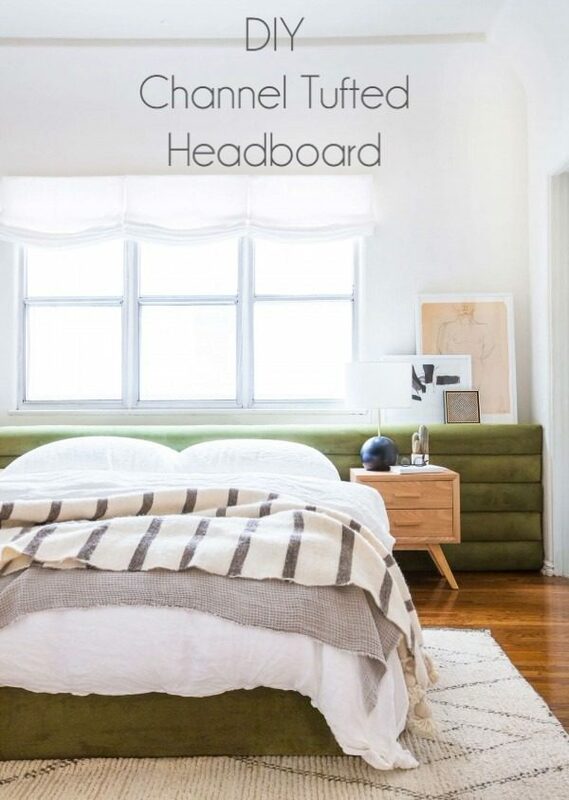 You need to go no further than this great spin-off on the very idea of a headboard. What is more, it is super easy to prepare. All you need are two metal rods and some length of fabric and there is your canopy headboard ready in little to no time. Check out the step-by-step guide on the tutorial to find how to DIY this. We love this rope headboard idea for the simple and elegant look of the finished product. Once more, you use an old door as the base and wind the ropes around it to make the headboard. As for the color and texture of the ropes, you can choose anything that you think will suit your existing décor – just make sure the ropes are sturdy enough. Follow the tutorial guide to make this DIY project. Made with West Elm paper flowers, this one again is unique and can act as a high focal point for your room. 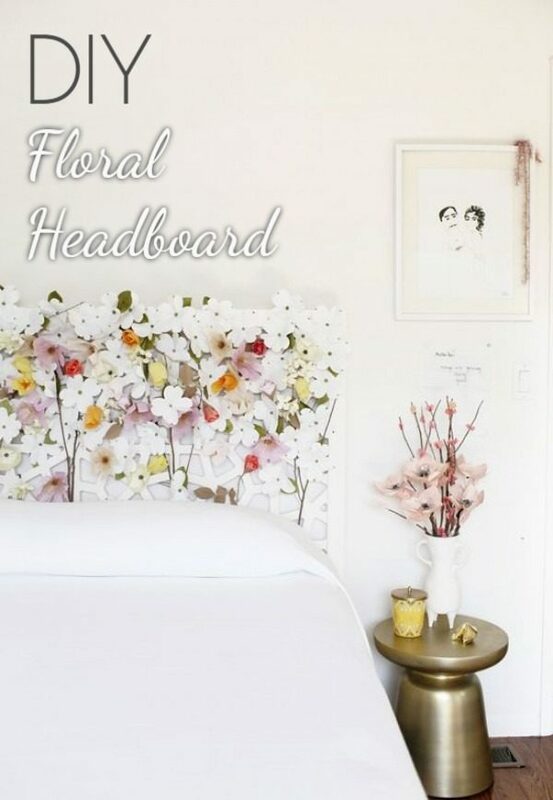 Follow the tutorial to prepare this floral headboard made with a white Moroccan headboard as the base with paper flowers taped to in a beautiful and eye-catching pattern. This is a very different and unique headboard design than others. It’s rather a wall hanging than a real headboard, but it adds as much decor value nonetheless. And it’s as simple as making macrame. So if woodworking is not your thing, try this project idea. There’s a great tutorial for you to follow. 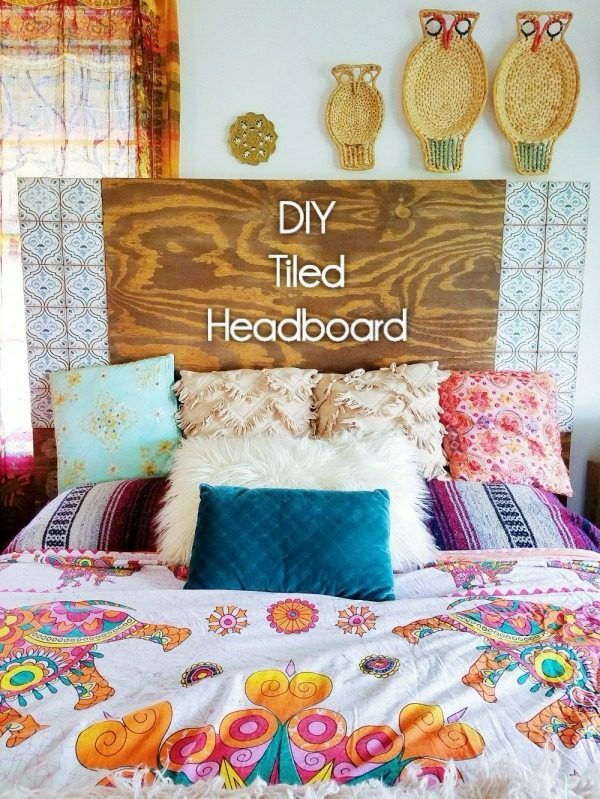 You can use literally any material you like to create your DIY headboard. If you’re looking for a headboard that is comfortable because you enjoy sitting up in bed, then you should go for a fabric headboard. Fabrics such as suede, plush, satin and so on are all comfortable materials or fabrics to sit up against. However, if you’re looking for a headboard that looks great and you have no intention of sitting up in bed and reading or using your laptop or cell phone, then you should instead go for a wooden headboard. Wooden headboards look fantastic however they, not the most comfortable when it comes to sitting up in bed. Other types of headboards that are great for aesthetic appeal but not comfortable would be glass, metal, and headboards that have storage or shelves in them. These types of headboards are more for the appearance rather than practicality and functionality. If you are planning on creating a DIY headboard, you are going to need a large, sturdy table to work on. You will also need an electric drill, electric screwdriver, table saw, hand saw, sander, sandpaper, nail gun, foam, paint, buttons and any other accessories that you feel will make your DIY headboard better. You don’t need to be a professional to make your DIY headboard. However, you will need some basic skills. It’s a very good idea to know your way around a woodshop, and you need to know how to make use of saws, drills, and screwdrivers. You also need to have a good handle when it comes to measurements and alignment. Overall speaking, you also need to have an eye for what looks good and what doesn’t. After all, the goal is to create attractive headboards, not ones you want to hide in your basement or woodshop. So when it comes to making DIY headboards, you also need to be able to follow instructions. This skill is especially handy if you are using an instructional video for guidance. Do an ample amount of research into the available materials, styles, designs, and trends in DIY headboards. Use our extensive list of tutorials above. However, if the idea of merely copying what others do is not appealing to you, all you need to do is add your own unique or custom twists to your DIY headboard. Ultimately, the more unique it is the better it is for you. Once you have a handle on making a DIY headboard, you should keep attempting it. Try coming up with unique designs and concepts. Each masterpiece can be used in each bedroom of the house. You can also start giving samples away to family and friends, and who knows, this could turn out to be a great side income for you. If you have the passion and determination to create DIY headboards, don’t let anything stop you. And when you finally build your headboard, feel free to pin this post on Pinterest and share your pictures with your fellow DIYers. Good luck!